On a microscopic scale, nearly all the machinery that keeps your cells working involves chemical reactions of some sort. Lots of these reactions wouldn’t happen without a helping hand. At the molecular nano-scale, nature’s helping hands are called enzymes, and they’ve sparked plenty of recent controversy amongst biophysicists (see, e.g., this or that). One sticky issue concerns the interrelationship between enzyme motion and quantum phenomena – in particular quantum tunnelling. It’s been known for some time that a whole host of reactions across a range of chemistry and biology involve quantum tunnelling, and scientists have developed accurate models to describe it. However, a number of experimental observations have led to recent suggestions that quantum tunnelling models for chemical reactions are inadequate when enzymes are involved. A corollary of this proposal is that enzymes may somehow be modifying tunneling – and that we therefore require new models for understanding how enzymes work. 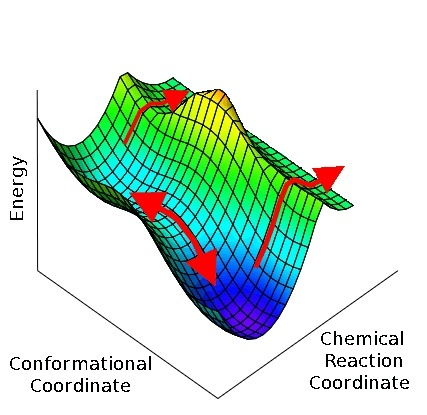 In a Nature Chemistry paper posted today, myself, J.N. Harvey, and A.J. Mulholland took Ockham’s razor to the enzyme tunneling problem. Contrary to previous proposals, we use some simple math to show that standard models for describing quantum tunneling can explain the experimental enzyme data, so long as one accounts for the fact that enzymes have multidimensional energy landscapes. This feature of biochemical systems has been highlighted for some time by folks who study protein folding – and our paper suggests that related models do alright for enzymes too.